Jot form will not allow me to delete forms at the moment. It says that it is "not an authorized action"
We apologize for this inconvenience. I did a small test but I can not replicate the error you are seeing. As you can see the form is being deleted and there was a delete animation. 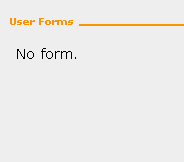 I also noticed that you do not have any forms. Most of your forms are shared by the username GeoArm. It is probably because that the form you are deleting, does not have edit permissions or previously had edit permission but was changed before the time you attempted to delete the form.